West Seattle's community of Gatewood has a small slice of Puget Sound coastline and is mainly residential. Many single family homes for sale here in Gatewood range from older to newer, with a small town neighborhood feel and views of the Sound. The neighborhood has its own school, Gatewood Elementary, belonging to the Seattle Public School District. Nearby communities are Fauntleroy, Seaview, Fairmount Park, and Delridge. The West Seattle Bridge to downtown and I-5 is less than 5 miles away. 4 Beds | 3 Baths | 3530 sq. Ft.
3 Beds | 3.5 Baths | 1900 sq. Ft.
3 Beds | 2.25 Baths | 1326 sq. Ft.
5 Beds | 4.25 Baths | 4320 sq. Ft.
3 Beds | 1.5 Baths | 1440 sq. Ft.
1 Beds | 1 Baths | 425 sq. Ft.
3 Beds | 1.5 Baths | 1306 sq. Ft.
Blue Summit Realty has the most accurate and up to date Gatewood real estate listings on the web. Currently there are 10 homes for sale, 3 condos for sale, in Gatewood. Of the 13 total Gatewood residential listings for sale 0 are bank owned, 0 are short sales, 0 are new construction, and 0 are townhomes. The price ranges from $240,000 to $0 with a median list price of $671,654 and median sold price of $653,793. Make sure to refine your Gatewood real estate search by property type, price, square footage, bedrooms, bathrooms and more with the search tool above or view the Gatewood listings on our interactive map. 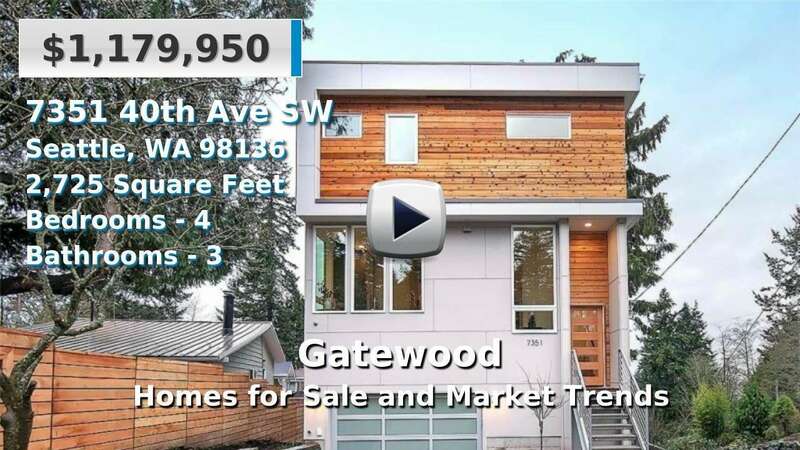 Our Gatewood real estate listings were updated 23 minutes ago.